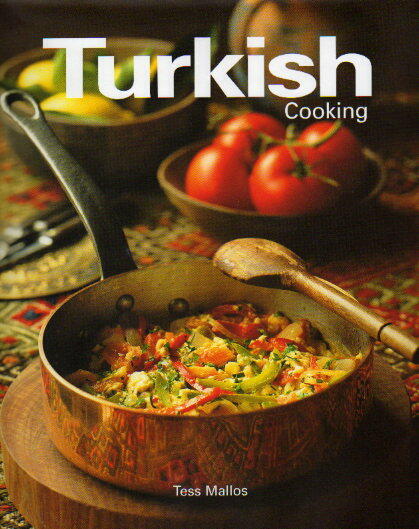 I am so surprised that there are not more Turkish cookbooks around. It’s a cuisine that has had a huge influence on the entire Mediterranean region. Even if you have never taken a holiday in Turkey you will be sure to recognise some of the dishes. The names might change from country to country but the style of food will be familiar. Tess Mallos is an author with a wealth of experience. She has worked as a consultant in the food industry for over 40 years. She has developed recipes, written books and magazine articles, and prepared food for photography and TV. She was born in Australia to Greek parents and she has a remarkable knowledge of food from both the Mediterranean and the Middle East. All the best and most popular Turkish dishes seem to be included. For those of you who have been lucky enough to travel, Turkish Cooking will transport you back to city breaks in Istanbul or holidays by the Aegean. The recipes are traditional but accessible to us in Northern Europe, and very few demand ingredients that need a specialist Middle Eastern deli. Pilaf in Pastry (Yufkali ic pilavi) is one of my favourite Turkish dishes. It looks like an old-fashioned steak and kidney pudding but the crust is of light filo pastry. This is a sophisticated pie stuffed with rice and lamb with dried apricots and slivered almonds. It makes a lovely centrepiece for a light lunch. Turkish Cooking has plenty to tempt vegetarians. Leek Pie (Pirasapide) has a tangy filling. Feta cheese offers a salty note which is a tasty contrast to the sweetness of the vegetables. A shortcrust pastry is used here rather than the less robust filo. This pie is truly delicious and works well as picnic food. It’s no surprise to find Turkish Delight (Lokum). Freshly made it’s tender with delicate flavours and superior to anything that you could buy in a British supermarket. Baklava is one of the most ubiquitous desserts and it’s not difficult to make. If you want a light and refreshing treat then Water Ice is just what you are looking for. Tess has a selection here from the usual Lemon to the more exotic Cherry and you don’t need an ice cream maker to prepare these refreshing palate cleansers. What an impressive end to a real Turkish meal or even as a cooler on a hot afternoon! Turkish Cooking offers all the classics and more, and if you are looking for a Mediterranean cookbook then this one offers lots to tempt you.